Designed by Robert Trent Jones Jnr. Golf travel writer Steve Killick was recently in Lisbon and returned raving about this RTJ2 and Kyle Phillips track. “It is every bit as dramatic as, say, Praia D’El Rey – just without any residential development,” says Killick. Known as a brutal course, it has woodland and hillside sections. Nestled high up in the Sintra hills, this former site of an ancient monastery now has two challenging courses (the Monastery and the Atlantic) which enjoy panoramic vistas of the Estoril and Sintra coastline in the distance. The unusual pink clubhouse and hotel are inforgettable! 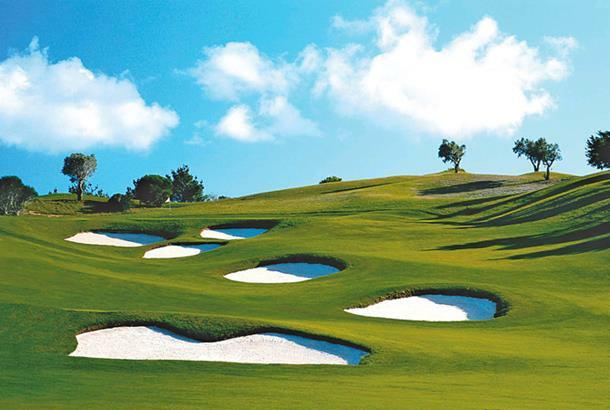 Set within the protected area of Sintra and Cascais, the Penha Longa Atlantic course combines an irregular terrain with excellent sea and mountain views, in a championship-quality course. This is considered to be one of the best courses of the European Tour. With 18 holes, par 72. It is supported by a hotel, two putting greens, driving range with 20 bays on grass, restaurant, bar and golf shop. For week to week conditions of the course check my blog before you book, http://penhalongamembers.blogspot.com/ The conditions still are not perfect.